Hi to everyone on Lotus Elan Central, my name's Phil and I am part of the team behind 'Lotus in the Peak' (LitP), an annual event organised by MLOC and held in the grounds of Chatsworth House, set within Derbyshire's glorious Peak District. The Midlands Lotus Owners Club (MLOC) would like to welcome Lotus owners everywhere to our annual summer event in Derbyshire, over the weekend of Saturday 16th and Sunday 17th July. We try hard to make it a good day out for all the family rather than simply cars in a field and there are a host of other attractions at Chatsworth including a fantastic adventure playground for the kids, the House, ornamental gardens and maze. We had quite a few visitors from different parts of the UK last year which was fantastic and even a couple from France in their Lotus Europa, which added to the fun enormously. We also had the support of our local Lotus dealers who brought along some very interesting cars for us to view. This year we hope to be visited by some intrepid members of the Lotus Car Club of Sweden, who are celebrating their club’s 40th anniversary with a 13 day tour of the UK! 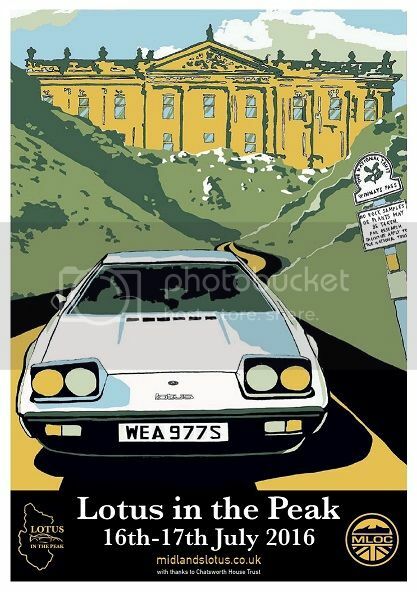 As well as being very beautiful, the Derbyshire Peak District has the attraction of being central, so we hope to tempt some cars down from Scotland and across from Wales as well as up from the south. It will make for a fabulous weekend break we promise you. The event is now in its fifth consecutive year, with numbers increasing year on year. Year one saw 56 cars, last year the number was around 180. This year we hope to see in excess of 200 cars, weather permitting and would like to see as many examples represented as possible. Previously we have had a very good turnout of some of the earlier models like Excels, Eclats, Elans and Esprits and a Sunbeam but disappointingly no Cortinas or Carltons so we would welcome seeing those this year too. It really is a great fun event. We hope to see you there so put the date in your diary now! Dean, Simon, Phil and the MLOC team. Over 50 cars booked on the run now already, including a selection of Esprits, an Excel, some Eclats, a 340R, old Elans, some M100s and of course plenty of Elises, Exiges and an Evora. Wow, I love the poster! Thanks HJ2, there's a few limited edition signed prints still available to purchase in the MLOC store. There's some photos of the poster within the thread below. The UK price is £26, would have to confirm postage costs to Holland should you be interested? No problem, I fully understand. Hope the project is going well! Nearly 80 cars booked on the runs now, including 5 cars travelling all the way from Sweden! A new record for distance travelled to LitP. Still plenty of room for anyone else wishing to attend. Central Lotus, our sponsor for this year, will be taking part in the early morning runs with an Evora 400 and an Exige S.
The South West Wales Lotus Club are bringing 8 cars and making a weekend of it. They have their hotel booked and will be attending the Saturday night Warm Up too! Paul Shipley of PJS Classic and Race Cars (Burton on Trent) has kindly agreed to provide the trophies for the Car of The Day competition and will also be bringing his full - house Elan 26R along. If we are lucky we may even see it on one of the runs - look for the man with earplugs! Over 100 cars booked on now, most of whom are participating in the runs, the remainder opting to have a lie in and arrive straight to Chatsworth. If you fancy it head over to midlandslotus.co.uk to book. I will be there plus one other M100 and possibly an Elise. Just 4 weeks to go now until the big event! Whilst places at Chatsworth are unlimited, anyone wishing to join in on one of the Sunday morning runs should get their name down soon. We already have over 100 cars confirmed on the runs which is brilliant but currently only have space for a maximum of 120. Thank you to all of the above for their extremely generous support of this club and event. There's now only a couple of days left to pre-book your place. The LitP event- including runs, catered picnics and raffle tickets will be taken out of the MLOC online store at 6.30pm on Wednesday 13th July. Tickets for attending Chatsworth only will be available at the gate and raffle tickets can be purchased on the day but places on the run and picnics must be purchased in advance. Please note we do not have many places left on the runs. We will do our best to accommodate everyone but reserve the right to bring the run deadline forward if we receive a flurry of late bookings. We have a total of 147 Lotus cars booked and pre-paid for the event now, 120 of which are on the morning runs. The weather looks like being dry too so we expect a good number more will turn up and pay on the gate. It looks like being our biggest event yet! Well we had 210 Lotus cars on the day, a record turnout, including a number of M100 Elans. Thanks to those of you who attended and we hope to see more of you again next year.